Basically, you started out the game by putting all these little sticks through some holes in the middle of an hourglass style plastic tube. Then you dumped marbles in the top, which were blocked by the sticks. Then you took turns pulling the sticks out, hoping that the marbles wouldn't fall. If they did, you were, as the commercial jingle made clear, "sunk." This game popped into my head the other day as I thought about some time management struggles I'm having. Last January, I joined a roller derby league just as the new semester started. I was juggling teaching, studying for my doctoral exams, and being a wife and mother with practicing roller derby at least twice and week and attending fundraising events for the league as well. I was also running two or three times a week and lifting weights. I remember it being hectic but not impossible. I remember it fitting together into a nice little nest of busyness. Then I broke my ankle. I've only been to a few practices (off skates, just to help with officiating) since then. I want to go to more, but I cannot for the life of me figure out how I made the time in my schedule to make this happen. 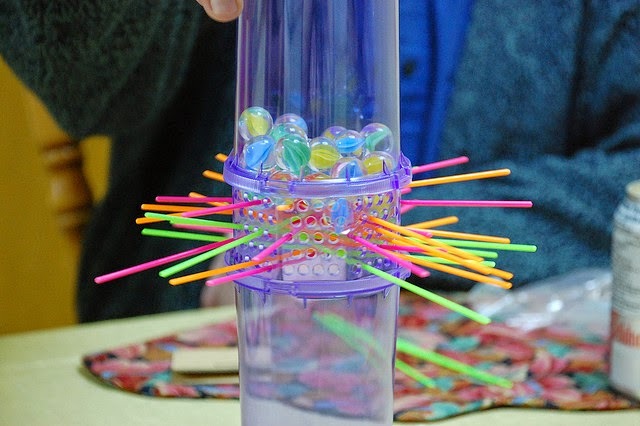 I think it might work a lot like those Ker-Plunk sticks; once you've pulled them out, the marbles shift, and you can't put them back in. It was less than a year ago, but the metaphorical marbles of my life have shifted drastically in that time. I passed my doctoral exams, which were the motivation for joining the league in the first place. I needed a way to get out of my head, to do something so physically demanding that it made me 100% present in the moment and not anxiously running over the dates of ancient rhetoricians' beheadings. Now I'm working on a dissertation, a task of an immensely different nature and one for which I very much need to be in my head, not out of it. I was healthy and active before the ankle break, but now I'm limping most days and can't run or jump. I have faith that I'll get these skills back, but being surrounded by friends who are jumping, skating, and generally demonstrating a bodily ability that I can't have right now makes me sad--even if I know it shouldn't. There are plenty of other times that the marbles have shifted. Having a baby definitely threw all the previous time management rules out the window. Becoming a full-time faculty member did it again. Those, though, are the kinds of major, rule-changing life events that I expect. It feels a little harder to deal when the marbles fell all on their own, when something else (beyond my control) pulled the sticks out. Sometimes not being able to find the time is a tool we use to block ourselves from facing the realities surrounding the way we set our priorities. Sometimes it's the buffer we use to help us make decisions about what really matters. And sometimes it's hard to tell which is which.